Social Media. It's one of those things that you likely have a love/hate relationship with. You know social media is crucial to getting visible and in front of your ideal clients. But you also know that it takes So. Much. Time. BUT ... are you profiting from you efforts? Do you even know if what you're doing is working? Do you have revenue rolling in directly from your posts on social media? If the answer is NO to any one of these questions, then we've got a problem! If you're spending the time to create a perfectly styled Instagram shot, write a compelling caption, and pick the ideal time to post it when you're sure most of your followers are active, then you NEED a return on your time investment. Every single one of your posts on social media should have a GOAL. Notice, I didn't say that they all should have a monetary purpose or a goal to sell, sell, sell (although many will in some capacity), but I did say that you should know the exact purpose of why you're tweeting, gramming, or pinning, each and every time. If Pinterest is part of your plan for 2017 and beyond (and you're absolutely leaving money and clients on the table if it's not), be sure to join my FREE 5 Day Pinterest Power eCourse. Click the button or image below to sign up! Now, here's the truth. There are concrete reasons why you have more social media fans than you have hard cash $ profit rolling in. I'm proud of you for your success in growing your follower numbers! That absolutely should be a goal of your's on social media. Don't let anyone tell you otherwise. Numbers do matter. But the number growing in your business bank account matters MORE. Let's put our primary focus on that one! 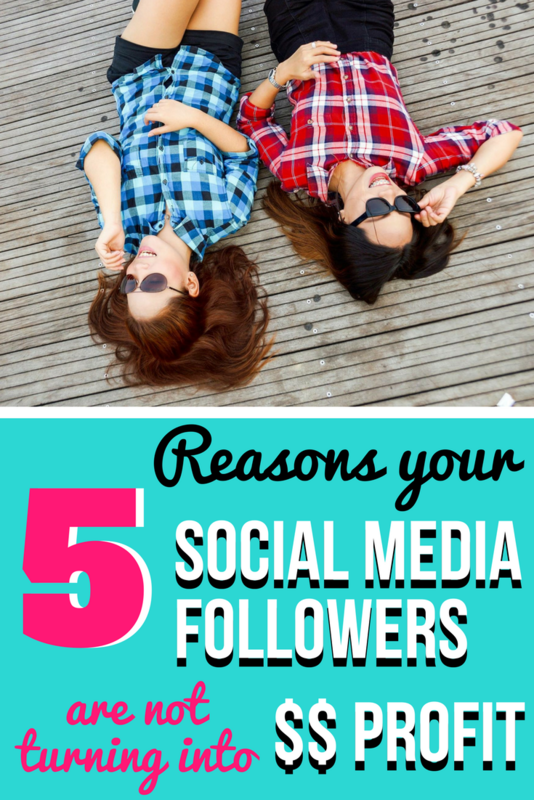 5 reasons you have more social media fans than $ profit. AND concrete steps to fix each one! Reason #1: You're not sharing your own stuff. No one wants to be seen as "spammy." I get it. And yes, if you join a Pinterest group board and start sharing ONLY your blog posts, or you join a Facebook group and start right off the bat with self-promotion, then I (and everyone else) am not going to really care about what you're sharing. It's yucky to only talk about yourself. Would you walk into a party and start tooting your own horn before anyone knows you? I hope not. So don't do it on social media either. With that said .... don't go to the other extreme. If you're ONLY tweeting out others' promotions, and only re-pinning others' content, then you're missing the whole point of social media. If you have a business (which I assume you do if you're reading this) then you MUST be sharing your own content. The profit is not made directly on social media (most of the time). The profit is made when you get that follower back to your website, and get them purchasing your product/service, or get them on your email list. Pinterest: For every 10 pins I re-pin, 2 of the pins will be from my own website. Pssst ... Tailwind makes this task soooo much easier! Facebook: I'll spend 30 minutes in my targeted groups daily, providing value. 10 of those minutes will be focused on posting my own content (images, celebrations, promos (if allowed), updates about my business, tips related to my business focus). Twitter: I will schedule daily a minimum of one tweet about a blog post, one promo for my opt-in freebie, and one tip related to my business that links back to a sales/services/products page. The title of your blog post is very similar to the subject line of an email. It has ONE primary purpose - to get the reader to open it up! I'm not about deception or being "tricky." I hate feeling duped when I open an email or blog post that does not deliver the goods based on the title or subject line provided. I'm not promoting doing that at all. What I am saying, is you MUST take the time to create a compelling, engaging, interesting headline that makes your reader excited to see what's inside. If you spend the time to craft an amazing blog post, with killer resources and content, you better spend the time to create a title that "sells" the read. And on the other hand. If you're got a kickass blog post title then you better have the content behind it to back it up! The same goes for your blog graphic (that is Pinterest optimized I hope!). If you're not providing a beautifully branded image that clearly communicates to your reader through quality font, image, and design choices, then people are going to view you as amateur. Using free stock photos that you see EVERYWHERE, or cheezy comic sans font? If so, that tells me that you're not investing the time and energy into your branding, which makes me think it's unlikely that you're putting much thought into your content either. You'll probably not going to get the click through from me (or anyone else) based on the amateurish visuals that you're showcasing. You might have an AH-mazing blog post behind the graphic, but I'll never know since you're didn't do enough to compel me to click through. That's YOUR job to make me want to read. Commit to writing a compelling headline for all your blog posts going forward AND consider updating the titles of your past posts that aren't getting the "love" they deserve. Create a Pinterest image style guide template for use with every blog post image that you create going forward. If you need help creating your Pinterest-optimized Pin templates, I offer a set of 10 fully editable templates created in Canva, that you can easily tweak to match your brand. Find out more about the the template pack by clicking HERE, or on the image below. There's a funny thing about your readers and potential clients on the internet. When you tell them to do something, they are 100x (not an exact statistic!) more likely to do it, compared to if you don't say anything and just assume they know what to do. Click through to your website. Find your email signup form (if there even is one on your home page). That's 4 more steps than anyone is going to take, because you never included a call to action! Your call to action does not always have to be about asking for an actual "sale," but you should always be asking your reader to DO something. On Instagram and Pinterest, this call to action should be on EVERY post/pin that you create. On Pinterest, it's as easy as making the last sentence of your pin description say "Click through to find my free guide on ........" On Twitter, if you're active daily, call-to-action posts will be one of the categories of tweets that you write. On Periscope or other live streaming, absolutely tell your viewers where to go (a specific page of your website for a specific reason). 3. Use your ready-to-use call to action list at least once daily on each of your social media platforms. Get comfortable making the ask! You've heard the phrase "The money's in the list" right? Well sometimes even cliche phrase are true. In this case, I have to agree with that statement 100%. Every single person who comes to your website/blog should be given the opportunity to join your email list. And when I say given the opportunity, I mean they should be presented with multiple ENTICING reasons to hand over their name/mail on your website. All of the reasons that I've covered leading up to now have been about getting your followers back to your website. Your site is where they have the opportunity to "continue the conversation" and take action with your business. We don't want one time visitors that you have no way to contact. We want a way for you to continue to share your knowledge and offerings with those visitors. So our main, number one, primary, top priority (you get how important this is?) for ANYONE who lands on your site is to collect their name/email. Here's the thing about social media. Showing up for a month or two doesn't cut it. Getting busy and deciding you'll pick it back up later doesn't cut it. Posting random updates without any purpose behind them doesn't cut it. Having a concrete plan in place is the difference between an amateurish presence and the powerful presence of a leader in your industry. People need to see you showing up time and time again to get comfortable with you. They need to trust that you'll be there. They need to see your offerings multiple times before they decide to even click through to check them out. They need to be confident in your skill set, and your knowledge. You can do ALL of this through social media, but you MUST have a plan in place. If you're ready to get serious about your Pinterest presence don't miss out on my FREE 5 Day Pinterest Power eCourse. We're going to go step-by-step to create a complete profitable Pinterest plan, so that you have EVERYTHING you need to succeed on the Pinterest platform. Join us by clicking the button or image below to sign up! 1. Pinterest - Invest in a Pinterest scheduling program that will pin for you at optimal times for engagement from your audience (I suggest Tailwind). Schedule a minimum of 15+ pins per day. Remember, out of every 10 pins, 2 of them should be your own content. If you're not ready to invest the money yet in a scheduling program, commit to pinning 15 pins at some point during the day. Even if you do them all at one time, you will still see results. 2. Instagram - Plan out your month in advance! Spend one day to batch the taking of all your photographs and creating your quote images (if that's your style). I then upload the images to Dropbox and write out my captions in advance. When it's time to post each day, it's as simple as downloading the image from Dropbox and copy/pasting the caption. Sure, I take spontaneous pictures here and there, but it's a great comfort to know that I have a steady stream of content ready to go if I'm not feeling especially inspired that day. 3. Twitter - Get Buffer (even the free version will do) and schedule out your daily tweets. Shoot for a mix of sharing your own blog posts, opportunities to opt-in to your freebies, and sharing others' content (of course being sure to mention them when you do so). Quotes and images are also great for engagement purposes. Don't forget to include those calls to action that you created! Ok guys! You have have EVERYTHING you need to create a profitable social media strategy for 2019 and beyond. 29 Tips + Tricks from my 1st Webinar (with all free tools) and How you Can Do the SAME!